Yesha Council officials say they wish Peace Now building report was true, claim PM is 'punishing' Jewish communities for PA-Hamas pact. Yesha Council Chairman and head of the Binyamin Regional Council, Avi Roeh, called on Prime Minister Binyamin Netanyahu on Tuesday to reverse his decision to postpone a crucial meeting on building tenders for the Civil Administration. "[The cancellation] borders on gross intervention in the daily life of the residents of Judea and Samaria," Roeh stated. "We, the mayors, are not even informed and we hear things [only] through the media." "It disrupts our lives and prevents us from carrying out our mission: providing services to the residents who suffer from rocks, gunfire and firebombs on their roads," he continued. "At least let our residents be able to come home to an organized community, where schools and playgrounds have been built." Roeh also noted that several projects that the government itself had approved had also been postponed. "We are waiting for these meetings to allow the advancement for tenders for public buildings, dormitories, parks, schools and residential buildings for young couples," he noted. "This committee also discussed approving building tenders in communities which have already been built but still need to be officially approved." "For example, inside [the Samaria community of] Shevut Rachel, the state [itself] has built homes and those homes still do not have building permits, there is no urban planning program and there have been over two years of avoiding the topic," he explained. "In Mevo Horon, a community in Binyamin, we have a situation where it was established more than forty years ago, but now they won't allow us to build a school because someone discovered that the paperwork was never properly filed." Roeh lamented that, instead of punishing the Palestinian Authority (PA) for uniting with Hamas, Jewish communities in Judea and Samaria are getting kicked when they're down. "We are just one week after the Abbas-Hamas unity pact," he said. "The Cabinet is discussing ways to fight the PA's appeal to the UN, the expectation was that now we [Jews of Judea and Samaria] have a chance, and at the end we get precisely the opposite." "[Netanyahu] is creating an impossible pressure cooker here, we ask them to tell us how we are supposed to manage our daily lives and those of our residents," he lamented. "No outside force can just suddenly intervene and cancel all official discussion about continuing our lives in our communities." 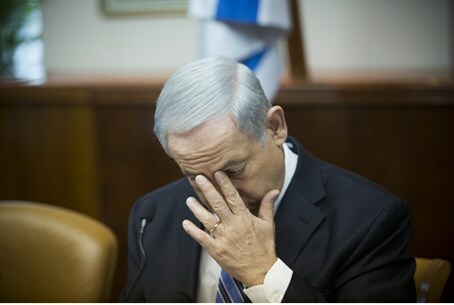 Netanyahu reportedly instructed Defense Minister Moshe Ya'alon to cancel the planned hearing for building tenders on Tuesday morning, in a move possibly connected to a report published by Peace Now. The far-left group claimed that building in Judea and Samaria had quadrupled over the past year and derided Netanyahu for becoming "Prime Minister of the settlers." Yesha Council officials responded by reiterating the facts - which, they say, show the opposite of what Peace Now says. "Unfortunately, the pace of construction in Judea and Samaria and Jerusalem does not provide a solution to the increasing demand for housing, causing a rise in housing prices," Vice President of the Yesha Council, Yigal Dilmoni, stated. "The cynical report uses the phrase 'unprecedented building,' when in fact these are only preliminary planning meetings. The presentation of the report and the distorted data are essentially an embrace, by leftist organizations, of the attempt by [PA Chairman] Mahmoud Abbas and Hamas to blame Israel for the failure of negotiations."